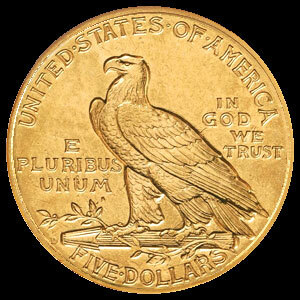 was commissioned by Theodore Roosevelt to fill the design vacancy caused by the death of Augustus Saint–Gaudens in 1907. Designed by Bela Lyon Pratt, it was engraved in the so–called Egyptian relief. Each coin contains .2419 ounces of gold. 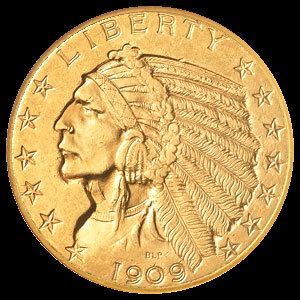 The obverse features an American Indian chief along with the words Liberty, thirteen stars, and the coinage date. The author’s initials are above the date.